Paul Weller To Play Rough Trade East In London On Record Store Day! – Paul Weller News! Paul Weller To Play Rough Trade East In London On Record Store Day! 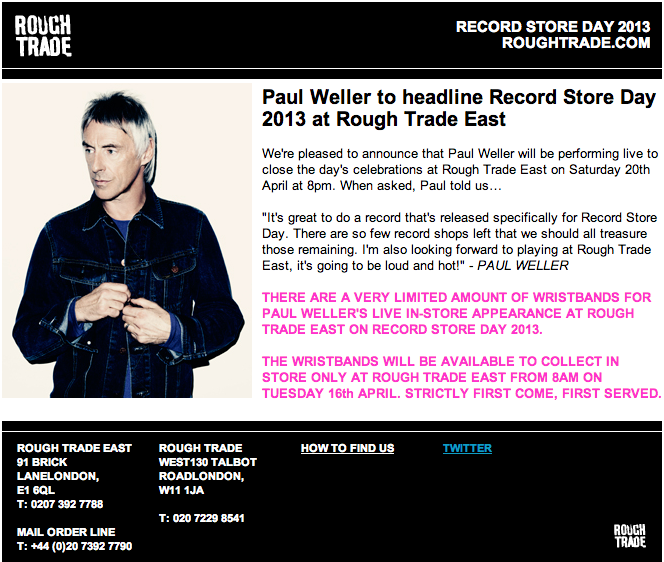 3 Comments on Paul Weller To Play Rough Trade East In London On Record Store Day! In support of Paul Weller’s exclusive release for Record Store Day 2013, Paul will be performing live at Rough Trade East in London this Saturday at 8pm! You must have a ticket/wristband to attend this free concert. Tickets are available at the shop starting tomorrow at 8am. Here’s a preview of “Flame – Out” b/w “The Olde Original,” an exclusive 45rpm that will only be available at your local independent record shop! Previous Entry Video Presentation Of Paul Weller’s "Sonik Kicks" Vinyl Record Store Day 45rpm Box Set! Next Entry Paul Weller Announces July US Tour Dates. Presale Starts Tomorrow (April 17)!